Transcription is tightly regulated to maintain energy homeostasis during periods of feeding or fasting, but the molecular factors that control these alternating gene programs are incompletely understood. Here, we find that the B cell lymphoma 6 (BCL6) repressor is enriched in the fed state and converges genome-wide with PPARα to potently suppress the induction of fasting transcription. Deletion of hepatocyte Bcl6 enhances lipid catabolism and ameliorates high-fat-diet-induced steatosis. In Ppara-null mice, hepatocyte Bcl6 ablation restores enhancer activity at PPARα-dependent genes and overcomes defective fasting-induced fatty acid oxidation and lipid accumulation. Together, these findings identify BCL6 as a negative regulator of oxidative metabolism and reveal that alternating recruitment of repressive and activating transcription factors to shared cis-regulatory regions dictates hepatic lipid handling. Obesity has nearly tripled worldwide since the 1970s. A major health concern related to obesity is that excess fat can spill into organs such as the liver. This can lead to fatty liver disease or even liver cancer. Therefore, it is important to fully understand the mechanisms that lead to fat accumulation in the liver in order to develop new treatments. Our bodies are designed to even out the highs and lows of an unpredictable diet by storing and releasing calories. When we are well-fed, liver cells switch on genes involved in making fat. When we have not eaten for a while, they switch them off and turn on genes involved in burning fat. Each switch involves thousands of genes, controlled by proteins called transcription factors. Some work as activators, turning genes on, whilst others work as repressors, turning genes off. For example, the transcription factor PPAR alpha is a well-known activator that helps to regulate fat burning. However, we know much less about the repressors that stop cells burning fat when there is plenty of food available. To find out more, Sommars et al. studied the repressor BCL6 in mouse liver cells. The results revealed that BCL6 interacts with hundreds of the same genes as PPAR alpha. When the mice were eating, BCL6 turns off the genes involved in fat burning, but when they were starved PPAR alpha activated those genes. However, when BCL6 was experimentally removed, many fat-burning genes were permanently switched on. So, even when mice were fed a high-fat diet, they burned off fat in their livers. Understanding the role of genetic switches like PPAR alpha and BCL6 is crucial for understanding how and why our bodies store energy. This could help us to create treatments that enhance the liver's ability to burn excess fat. The classical studies of Jacob and Monod on the bacterial lac operon established a central paradigm for transcriptional repression to direct metabolic responses and sustain life in an environment of discontinuous food supply (Jacob and Monod, 1961; Payankaulam et al., 2010). In metazoans, nutrient-elicited transcription likewise coordinates the feeding to fasting transition of metabolism, yet a gap remains in our knowledge of the participating factors and their genomic coordination. In the fed state, sterol and carbohydrate regulatory element-binding proteins (SREBP and ChREBP) direct lipogenesis and glycolysis (Abdul-Wahed et al., 2017; Horton et al., 2002). Conversely, fasting disinhibits forkhead box transcription factors (FOXOs) and activates glucocorticoid receptor (GR) and cAMP response element binding protein (CREB) to promote gluconeogenesis (Rui, 2014). Extended fasting further stimulates peroxisome proliferator-activated receptor alpha (PPARα) to induce fatty acid oxidation, ketogenesis, and the fasting hormone FGF21 (Badman et al., 2007; Inagaki et al., 2007; Kersten et al., 1999; Leone et al., 1999). Despite progress revealing these various transcriptional activators, their dynamic genome-wide regulation and the influence of additional factors, particularly repressors, on the feeding to fasting transition remains poorly understood (Goldstein and Hager, 2015). Recently, fasting-regulated enhancers were mapped using H3K27 acetylation ChIP- and DNase I hypersensitivity sequencing and footprinting, which inferred the presence of unknown repressors at regions enriched with STAT motifs (Goldstein et al., 2017). Our focus turned to B-cell lymphoma 6 (BCL6), a key immune cell repressor with affinity for STAT-like DNA recognition sequences (Dent et al., 1998; Dent et al., 1997; Zhang et al., 2012). BCL6 is a member of the ZBTB family of C2H2-type zinc finger proteins and represses transcription through a variety of interactions with corepressors including SMRT, NCoR, BCoR, CtBP, MTA3/NuRD, and HDACs (Basso and Dalla-Favera, 2012). Although well-recognized for critical roles in B-cell and T-cell development and lymphomagenesis, BCL6 is also broadly expressed outside of the immune system where its functions are largely unknown. In this work, using genome-wide DNA binding and transcriptomic analyses as well as hepatocyte-specific gene targeting, we reveal an unexpected role for BCL6 as a potent antagonist of PPARα-directed gene regulation. We find that BCL6 and PPARα bind independently at thousands of shared regulatory regions in sub-nucleosomal proximity, often at multiple locations along the same gene. Genes harboring these BCL6-PPARα regulatory modules constitute over 50% of fasting-responsive transcripts and exhibit particularly dynamic expression. Moreover, we find that ablation of hepatocyte Bcl6 increases lipid oxidation, prevents high-fat-diet-induced steatosis, and reverses fasting-related defects in Ppara-/- mice including aberrant enhancer activity, transcription, ketosis, and lipid accumulation. These restorations in Ppara-/- mice devoid of liver Bcl6 were linked to loss of HDAC3-containing BCL6 repressive complexes and enhanced recruitment of PPARδ to BCL6-PPAR shared enhancers. Together, these findings establish BCL6 as a critical repressor of oxidative metabolism. To establish the genomic sites for BCL6 regulation, we used ChIP-seq to map its genome-wide set of cis-acting targets (cistrome) in liver. Under fed conditions, we identified over fifteen thousand high confidence BCL6 binding sites from three biological replicates. Ontologies for nearby genes were dominated by lipid and ketone metabolism, PPAR signaling, and functions in peroxisomes and mitochondria (Figure 1A). Additionally, motif analysis of BCL6 binding sites compared to random whole genome sequences revealed striking enrichment of response elements not only for BCL6 but also for lipid-activated PPAR nuclear hormone receptors (Figure 1B) (Evans et al., 2004), the pioneer factor FOXA1, the enhancer remodeler C/EBP (Grøntved et al., 2013), and the developmental and lipid regulatory factors HNF4 (Hayhurst et al., 2001; Li et al., 2000) and HNF6 (Clotman et al., 2005; Zhang et al., 2016). Highly similar BCL6 peak calling, gene ontology and motif analysis was obtained using either wild-type liver input chromatin or BCL6 ChIP-seq from livers of hepatocyte-specific Bcl6 knockouts (Bcl6LKO mice) as background controls for enrichment (Figure 1—figure supplement 1A and B) indicating that the liver BCL6 cistrome reflected binding events specific to hepatocytes. BCL6 converges with PPARα at fasting-regulated lipid genes. (A) MSigDB Pathway and Gene Ontology (GO) Cellular Compartment analysis of BCL6 ChIP-seq binding sites. (B) Motif enrichment analysis of BCL6-bound regions. (C) Gene expression as measured by reads per kilobase of transcript per million reads (RPKM) of Ppara, Ppard, and Pparg in control (Bcl6fl/fl) mouse liver samples. N = 4 per group. (D) qPCR of Bcl6 and Ppara in fed and fasted Bcl6fl/fl mouse livers. N = 6–7 per group. (E) Western blot analysis of BCL6 and PPARα protein levels in ad libitum fed and overnight fasted C57BL/6 mouse livers. Densitometry normalized to actin levels is shown (right). (F) Venn diagrams comparing liver ChIP-seq peaks from ad libitum and overnight fasted mice using antibodies against BCL6 (top) and PPARα (middle). Overlap between combined fed and fasted BCL6 and PPARα binding sites (based on a distance between peak centers of <200 bp) is shown (bottom). ChIPs were performed in biological triplicates. (G) BCL6 and PPARα ChIP-seq tag densities at BCL6 unique, PPARα unique, or shared BCL6-PPARα peaks in fed and fasted states. (H) BCL6 (left) and PPARα (right) tag densities at BCL6-PPARα shared peaks in fed or fasted livers. N = 3 per group. A two-tailed Student’s t-test assuming equal variance was used to compare mean values between two groups. Data are represented as mean ±SEM. ∗p<0.05, ∗∗p<0.01, ∗∗∗p<0.001. Based on motif predictions, we pursued the possibility of genomic convergence between BCL6 and PPARs. Direct quantification of TF consensus sites near BCL6 binding sites further reflected enrichment of motifs for PPARs, its heterodimeric partner RXR, and to a lesser extent FXR, whereas motifs for other abundant liver transcription factors such as LXR were absent (Figure 1—figure supplement 1B). Ppara is the dominantly expressed PPAR subtype in liver (Figure 1C). In line with PPARα’s critical role to regulate the adaptive response to fasting, its RNA and protein levels increase with overnight food deprivation (Figure 1C–E) (Kersten et al., 1999). In contrast, Bcl6 mRNA and corresponding protein diminish sharply from the fed to the fasted state (Figure 1D and E). Accordingly, BCL6 occupancy was diminished at the majority of its binding sites and its cistrome was reduced by 39%, whereas PPARα recruitment was enhanced and its cistrome was expanded by 36% with fasting (Figure 1F, top and middle panels, and Figure 1—figure supplement 2A, left panel). In addition, fasting resulted in a redistribution of binding sites for each factor. Direct comparison of the combined fed and fasted ChIP-seq peaks for BCL6 and PPARα revealed 13,608 overlapping binding regions (<200 bp between peak centers) between these factors, representing 77% and 41% of the BCL6 and PPARα cistromes, respectively (Figure 1F, bottom panel). Of these overlapping peaks, the vast majority (>96%) demonstrated a distance of <100 bp between peak centers (Figure 1—figure supplement 2B). Over 95% of these overlapping sites occurred outside of promoter regions in intragenic and intergenic locations (Figure 1—figure supplement 2C). BCL6-PPARα co-occurring peaks represented the strongest binding events for each factor, indicating they likely represent true DNA interactions as opposed to non-specific events at open chromatin regions (Figure 1G) (Landt et al., 2012). At these shared sites, binding by BCL6 decreased while PPARα increased upon fasting (Figure 1H and Figure 1—figure supplement 2A, right panel), which was evident at several PPARα target genes, such as Acot4/3 and Por (Figure 1—figure supplement 2D and E) and confirmed by ChIP qPCR (Figure 1—figure supplement 2F). Thus, extensive cistromic overlap and reciprocal genome-wide binding suggested BCL6 and PPARα may control a common regulatory program. Next, we assessed whether BCL6 and PPARs compete or collaborate for DNA binding. Using livers from Ppara-/- and wild-type control mice, we found that ablation of Ppara had no impact on BCL6 enrichment at BCL6-PPARα binding sites (Figure 2A, left panel and Figure 1—figure supplement 2D). Likewise, liver-specific deletion of Bcl6 did not alter PPARα binding (Figure 2A, right panel and Figure 1—figure supplement 2E). Ppard is expressed at relatively low levels in liver (Figure 1C), but it was previously reported that unliganded PPARδ binds and sequesters BCL6, releasing it in the presence of PPARδ ligands (Lee et al., 2003). Thus, to test whether a protein complex between PPARδ and BCL6 could account for BCL6-PPAR genomic co-localization, we characterized BCL6 binding in the presence or absence of hepatocyte PPARδ using mice harboring floxed alleles of Ppard and Albumin-Cre (PpardLKO mice). The livers of PpardLKO animals exhibited 96% decreased levels of Ppard mRNA with no significant change in Bcl6 (Figure 2—figure supplement 1A), yet in comparison to wild type control livers, BCL6 binding was unaltered across the BCL6 cistrome and at its subset of BCL6-PPARα shared sites (Figure 2B and C). Thus, these findings did not support a model in which BCL6 binds to PPARs on chromatin. BCL6 genome-wide DNA binding is independent of PPARα and PPARδ. (A) BCL6 ChIP-seq tag densities in C57BL/6 and Ppara-/- livers at shared BCL6-PPARα peaks (left). PPARα tag density in Bcl6fl/fl and Bcl6LKO livers at shared BCL6-PPARα peaks (right). (B) BCL6 tag densities in control and PpardLKO mouse livers at all BCL6 peaks (left) or shared BCL6-PPARα peaks (right), N = 2 per group. (C) UCSC genome browser tracks showing PPARα, PPARδ, and BCL6 ChIP-seq in control fed livers (blue), control fasted livers (red), or PpardLKO livers (black). (D) Venn diagram showing overlap of PPARδ, BCL6, and PPARα cistromes in mouse liver. Cistromes for each factor include peaks identified in either fed or fasted livers. Peaks were considered overlapping if peak centers were within 200 bp. ChIPs were performed in biological triplicates. (E) Gene ontology enrichment for binding regions common among BCL6, PPARα, and PPARδ (Shared); exclusive to PPARα and PPARδ (PPARα-PPARδ); exclusive to BCL6 and PPARα (BCL6-PPARα); or exclusive to BCL6 (BCL6 only). Additionally, we mapped the liver PPARδ cistrome using an isotype-specific antibody. 8,194 PPARδ-binding sites were identified collectively in fed and fasted livers, 85% of which overlapped with the more extensive PPARα cistrome of 33,379 sites (Figure 2D). Overall, PPARδ binding was diminished by half upon fasting (Figure 2—figure supplement 1B), but this reduction was only evident at sites shared with PPARα such as the Acot4/3 and Ehhadh loci (Figure 2C), suggesting that PPARα and PPARδ compete for binding at common response elements (Figure 2—figure supplement 1C). While PPARδ and BCL6 co-localized at only 87 genomic sites without PPARα, we detected 8,975 BCL6-PPARα peaks which were not bound by PPARδ (Figure 2D). Gene ontology analysis revealed that BCL6-PPARα-PPARδ shared or BCL6-PPARα exclusive peaks annotate predominantly to genes controlling the metabolism of lipids and lipoproteins, fatty acids, triacylglycerol, ketone bodies, PPAR signaling, and biological oxidations (Figure 2E). 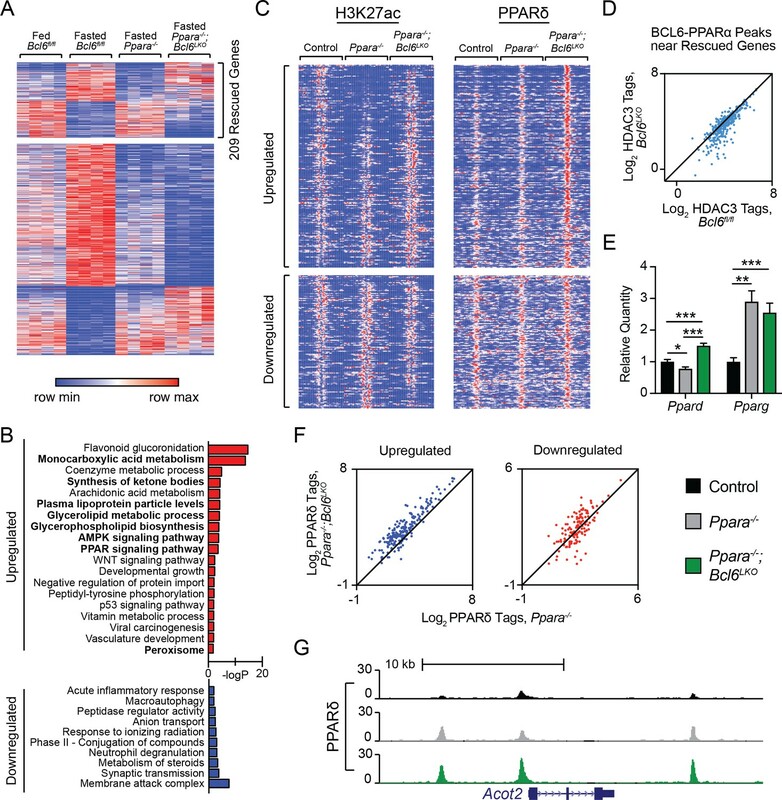 Collectively, these results provided further evidence that extensive BCL6 genome-wide colocalization with PPARα and, to a more limited degree, with PPARδ occurs due to independent, yet proximate DNA-binding events along genes controlling lipid metabolism. To better understand how BCL6 modulates gene expression in liver, we first identified the BCL6-regulated transcriptome. We generated mice with hepatocyte-specific Bcl6 deletion (Bcl6LKO) by crossing animals with floxed alleles of Bcl6 to mice expressing Cre under control of the albumin enhancer/promoter. Bcl6LKO mice exhibited 75% reduced Bcl6 mRNA and over 90% diminished protein levels in the liver (Figure 3—figure supplement 1A and B). In ad lib fed Bcl6LKO mice, RNA-seq revealed 721 upregulated genes, while only 362 were downregulated by more than two fold compared to controls (Figure 3A). These findings indicated that liver BCL6 predominantly functions as a repressor of transcription, which was particularly apparent at genes with strongly bound BCL6-binding sites (Figure 3B). BCL6 complexes with SMRT/NCoR-HDAC3 to reduce H3K27ac and represses transcription. (A) Volcano plots showing log2 fold change (LFC) in expression of fed Bcl6LKO over Bcl6fl/fl livers. Blue dots represent |LFC| greater than one with an adjusted p-value less than 0.05. Red dots represent remaining expressed genes. N = 4 per group. (B) BCL6 tags in control livers at BCL6 peaks near BCL6-activated, -repressed, or -unchanged genes. Box plots display interquartile range (box), median (horizontal black line), mean (black ‘+’), and min to max (whiskers). (C) Four-way Venn diagram comparing ad lib fed control BCL6, SMRT, NCoR and HDAC3 ChIP-seq peak sets. (D) Tag density of H3K27ac, SMRT, NCoR, and HDAC3 ChIP-seq in Bcl6fl/fl and Bcl6LKO livers at respective cofactor peaks co-bound with BCL6. ChIPs were performed in biological triplicates. For (B), a one-way ANOVA and Tukey’s post-hoc testing was used to compare tag density between groups. ∗p<1×10−3, ∗∗p<1×10−6, ∗∗∗p<1×10−9, ∗∗∗∗p<1×10−12. BCL6 is known to control transcription in immune cells through interactions with many different cofactors (Barish et al., 2012; Basso and Dalla-Favera, 2012; Hatzi et al., 2013). To test whether BCL6 regulates transcription through similar interactions in liver, we used ChIP-seq to characterize SMRT, NCoR, and HDAC3 binding in ad lib fed Bcl6fl/fl and Bcl6LKO mice. In Bcl6fl/fl animals, we found extensive cistrome overlap between BCL6 and all three corepressors (6,643 common sites), although 21% of BCL6 sites were unique (Figure 3C). SMRT and HDAC3 exhibited very few independent binding regions, with only ~2% unique for either cofactor. NCoR exhibited the most extensive cistrome, and 45% of its sites did not overlap with BCL6, HDAC3, or SMRT. In line with their known biochemical interactions, SMRT, NCoR, and HDAC3 peaks were enriched in motifs for nuclear receptors (ERR, PPAR, RXR) as well as FOX and HNF transcription factors when compared to whole genome DNA as background (Figure 3—figure supplement 2A) (Perissi et al., 2010). For each corepressor, we further analyzed peaks shared with BCL6 (peak centers colocalizing within 200 bp) and non-overlapping (unique) cofactor sites (Figure 3—figure supplement 2A). When compared against DNA sequences from unique peaks, shared peaks were overrepresented with motifs for BCL6, STAT, and FOX transcription factors, as well as CUX2 and HNF6. In contrast, when tested against the DNA sequences of BCL6-shared peaks, unique SMRT, NCoR, and HDAC3 sites were enriched in motifs for ETS and ELK transcription factors. Next, we quantified SMRT, NCoR, and HDAC3 occupancy at BCL6-binding sites that colocalized with corepressor peaks in control versus Bcl6LKO livers (Figure 3D and Figure 3—figure supplement 2B). For each corepressor, binding at BCL6 sites was significantly reduced in Bcl6LKO livers. Moreover, loss of these complexes was inversely correlated to histone 3 lysine 27 acetylation (H3K27ac), a marker for enhancer activity (Creyghton et al., 2010; Wang et al., 2008), which was significantly elevated along BCL6-SMRT/NCoR-HDAC3 sites in Bcl6LKO livers. Together, these findings revealed a role for BCL6 to recruit a subset of liver SMRT/NCoR-HDAC3 complexes and repress associated regulatory regions. 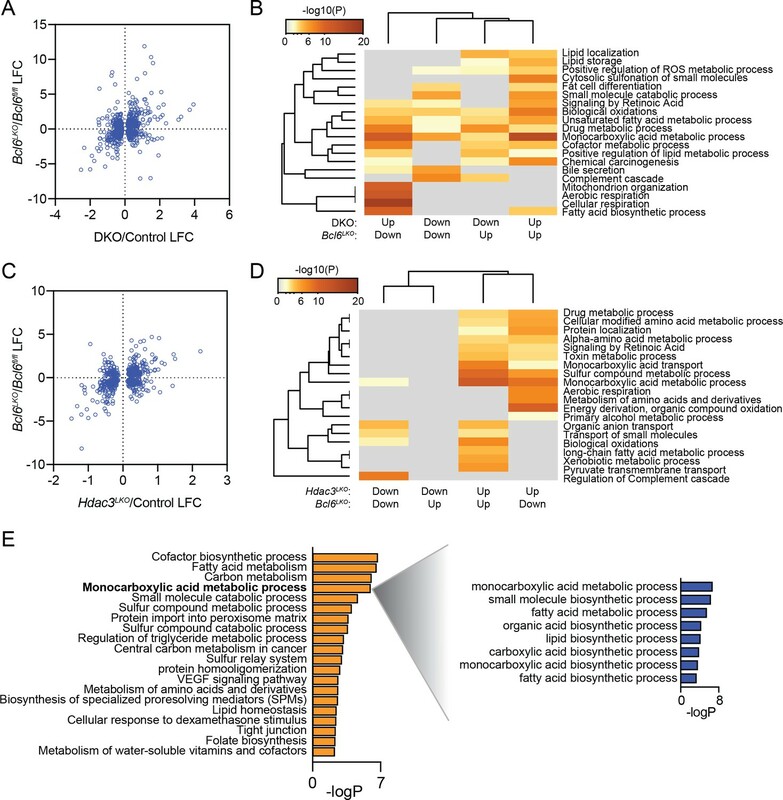 Gene ontology analysis of differentially expressed transcripts in the livers of Bcl6LKO animals revealed lipid metabolism, oxidation, and PPAR signaling as top scoring terms (Figure 4A). 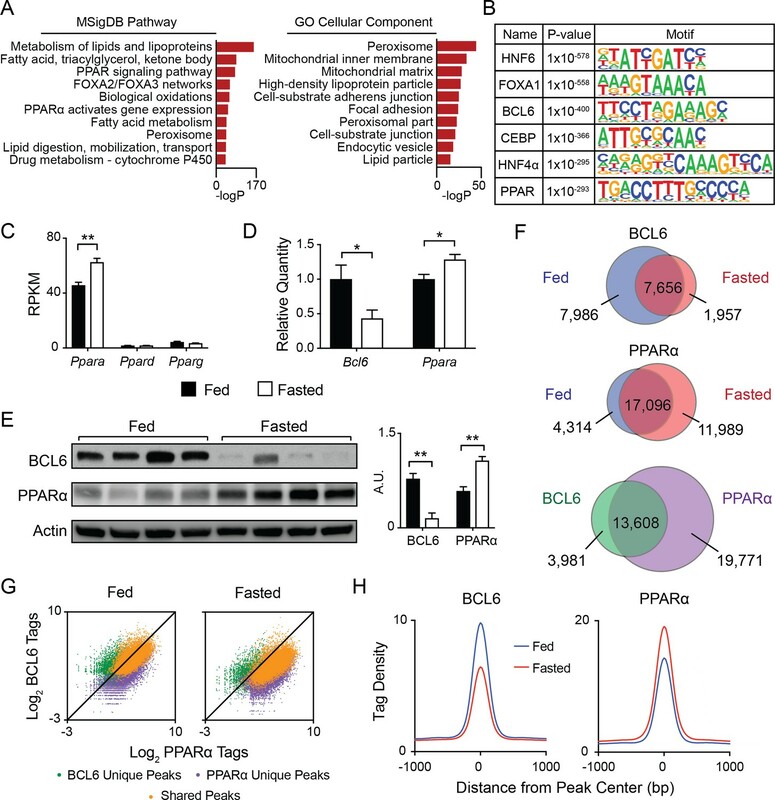 This regulatory signature and the extensive genomic intersection between BCL6 and PPARα prompted us to determine whether BCL6 could likewise control fasting-induced gene expression. Livers from mice restricted from food overnight exhibited 162 genes upregulated and 174 genes downregulated by at least 2-fold using RNA-seq (Figure 4B), and fasting regulated a common set of gene expression pathways with Bcl6 ablation (Figure 4A). Notably, over 40% of robustly regulated fasting genes (135/336) were controlled by BCL6 (Figure 4C, top panel) and for the vast majority, Bcl6 ablation mimicked the impact of fasting on transcription (Figure 4C, bottom panel and Figure 4D). Unsupervised clustering analyses of liver gene expression revealed that patterns in Bcl6LKO mice, irrespective of nutrition status, more closely resembled profiles from fasting than fed control mice (Figure 4D and Figure 4—figure supplement 1A). Genes co-regulated by fasting and Bcl6 deletion are enriched in ontologies for lipid and ketone body metabolism as well as PPARα signaling (Figure 4—figure supplement 1B). For example, visualization of ChIP-seq and RNA-seq tracks demonstrated that PPARα and BCL6 reciprocally occupy regions along the Acot4/3 and Vnn1 genes, whose expression was strongly induced by either fasting or Bcl6 ablation (Figure 4E). Quantitative PCR further confirmed dozens of liver genes that were similarly upregulated by fasting or Bcl6 ablation, including many involved in mitochondrial and peroxisomal β-oxidation (Abcd1/2, Acadvl, Acnat2, Acot2, Acot3/4, Ehhadh, Hadh, Idh2, Ucp2), microsomal ω-hydroxylation (Aldh3a2, Cyp4a31), ketogenesis (Acss3, Bdh1, Fgf21, Hmgcl), and lipid metabolism (Abhd2, Acot1, Cd36) (Figure 4—figure supplement 1C). Together, these results suggested that loss of Bcl6 mimics the fasting-induced transcriptional program controlling liver lipid metabolism. Bcl6 deletion de-represses a fasting liver gene program. (A) Pathway enrichment analysis for genes differentially expressed (|LFC| greater than one and an adjusted p-value less than 0.05) with fasting or Bcl6 deletion in liver. (B) Volcano plots showing log2 fold change (LFC) in expression of Bcl6fl/fl fasted over fed. Blue dots represent |LFC| greater than one with an adjusted p-value less than 0.05. Red dots represent remaining expressed genes. N = 4 per group. (C) Venn diagram comparing differentially expressed genes with fasting or Bcl6 deletion (top panel). Comparison of LFC between fed (Bcl6LKO/Bcl6fl/fl) (y-axis) and Bcl6fl/fl (fasted/fed) (x-axis) for genes differentially expressed by both fasting and Bcl6 deletion is shown (bottom panel). (D) Hierarchical clustering heatmap of RPKM values in fed and fasted Bcl6fl/fl and Bcl6LKO samples for genes regulated by both fasting and Bcl6 deletion. N = 4 per group. (E) UCSC genome browser tracks of BCL6 and PPARα ChIP-seq and RNA-seq data at PPARα-regulated genes, Acot4/3 and Vnn1 in control fed (blue), control fasted (red), and Bcl6LKO fed (black) livers. 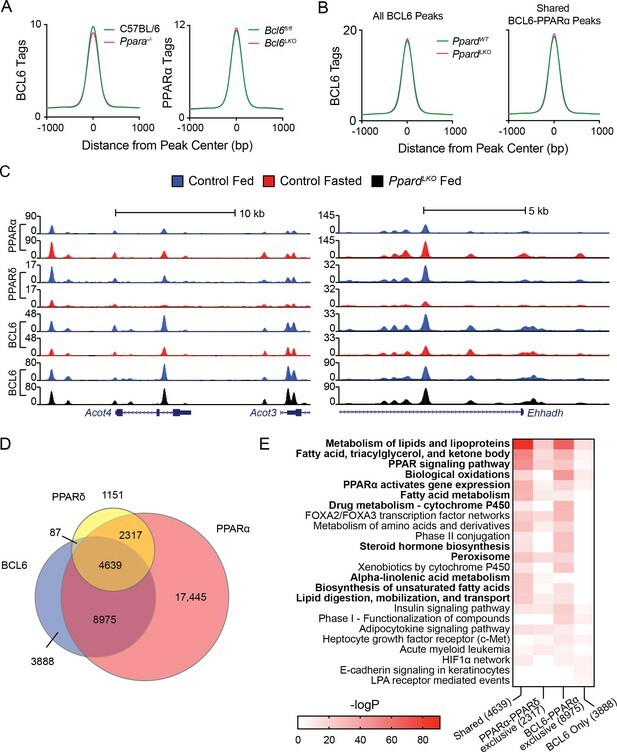 We next examined the extent to which BCL6 and PPARα cis-regulatory sites alone or in combination control fasting transcription. Hypergeometric testing revealed a 1.1-fold enrichment (p-value 3.8e-14) for BCL6-PPARα peaks relative to the entirety of PPARα genome-wide peaks along all genes differentially regulated (p-value<0.05) by fasting. Over 50% of these fasting genes contained co-occurring BCL6-PPARα-binding sites (Figure 4—figure supplement 2A), with a median of two co-occurring sites per gene (Figure 4—figure supplement 2B). By contrast, just 24% or 1.4% of fasting genes contained PPARα-only or BCL6-only sites, respectively, and these occurred with a median of just one regulatory region per gene. In addition, fasting-regulated genes with BCL6-PPARα regulatory elements exhibited significantly greater ranges of expression than those with PPARα peaks that lack this heterotypic module (Figure 4—figure supplement 2C), and their ontology was particularly enriched for functions in lipid regulation and oxidative metabolism (Figure 4—figure supplement 2D). In summary, over half of fasting-regulated genes are controlled by BCL6-PPARα-binding sites, and this gene subset is particularly dynamic in transcription. PPARα is critical for the fasting induction of genes mediating peroxisomal and mitochondrial fatty acid β-oxidation as well as microsomal ω-hydroxylation (Contreras et al., 2013; Gao et al., 2015; Hardwick et al., 2009; Hashimoto et al., 2000; Kersten et al., 1999; Leone et al., 1999; Montagner et al., 2016). To determine whether loss of the BCL6 repressor in liver compensates for transcriptional defects in Ppara-/- mice, we generated animals with combined whole body deletion of Ppara and liver-specific ablation of Bcl6 (Ppara-/-;Bcl6LKO mice). RNA-seq revealed that loss of Bcl6 rescued 209 of 795 dysregulated genes in fasted Ppara-/- mice compared to fasted controls (Figure 5A). Among genes normally upregulated with fasting, Bcl6 deletion restored expression of genes involved in monocarboxylic acid and lipoprotein metabolism; ketone body synthesis; AMPK and PPAR signaling; and peroxisomes (Figure 5B, top panel). By contrast, genes normally downregulated upon fasting and rescued in Ppara-/-;Bcl6LKO mice represented pathways mostly unrelated to lipid metabolism (Figure 5B, bottom panel). Restoration of Ppara-/- defective fasting transcription in Ppara-/-;Bcl6LKO mice was confirmed by qPCR at genes involved in β-oxidation (Acot2/3/4, Idh2), ω-hydroxylation (Aldh3a2, Cyp4a31), ketone body synthesis (Acss3, Fgf21, Hmgcl, Hmgcs2), and lipid metabolism (Abhd2, Cd36, Vldlr) (Figure 5—figure supplement 1). Thus, loss of Bcl6 restores expression at a subset of PPARα-directed genes controlling lipid metabolism. Bcl6 ablation reduces HDAC3 activity and promotes PPARδ binding in Ppara-/- mice at rescued genes. 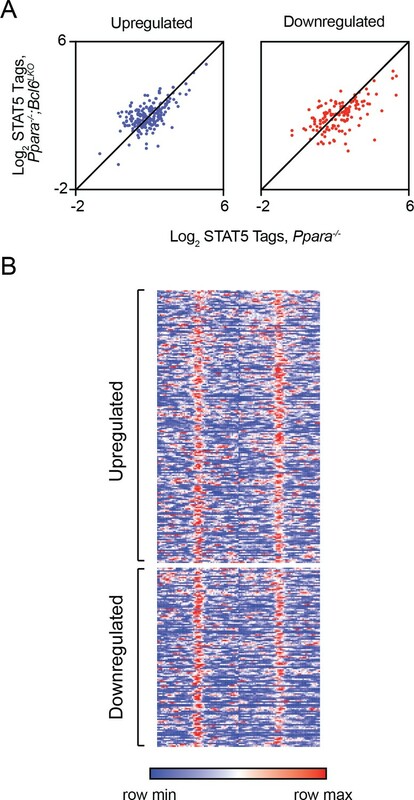 (A) Heatmap of RPKM values at fasting-regulated genes that are dysregulated in Ppara-/- mice. 209 genes have partially or completely restored expression upon fasting in Ppara-/-;Bcl6LKO mice. N = 4 per group. (B) Gene ontologies of upregulated (top) and downregulated (bottom) fasting genes restored in Ppara-/-;Bcl6LKO mice. (C) Heatmap of H3K27ac and PPARδ ChIP-seq in fasted control Bcl6fl/fl, Ppara-/-, and Ppara-/-;Bcl6LKO mice at BCL6-PPARα shared peaks that annotate to rescued Ppara-/- dysregulated genes in Ppara-/-;Bcl6LKO mice. N = 3 per group. (D) HDAC3 ChIP-seq tag density in Bcl6fl/fl and Bcl6LKO livers at BCL6-PPARα shared peaks near rescued fasting genes. (E) qPCR of Ppard and Pparg in fasted control, Ppara-/-, and Ppara-/-;Bcl6LKO mice. N = 5–6 per group. (F) PPARδ tag density at rescued upregulated (left) and downregulated (right) fasting genes in fasted Ppara-/-;Bcl6LKO and Ppara-/- livers. ChIP was performed in biological triplicate. (G) UCSC genome browser track of PPARδ ChIP-seq at Acot2. In (E), a one-way ANOVA and Holm-Sidak’s post-hoc testing was used to compare mean expression between groups. ∗p<0.05, ∗∗p<0.01, ∗∗∗p<0.001. Opposing regulation between PPARα and BCL6 was also observed at the level of chromatin modification. We profiled histone H3K27ac in overnight fasted Bcl6fl/fl control, Ppara-/-, and Ppara-/-;Bcl6LKO mice using ChIP-seq (Figure 5C, left panel). Fasting-induced genes with impaired expression in Ppara-/- mice demonstrated low H3K27ac signal around BCL6-PPARα-binding sites in Ppara-/- compared to control mice. By contrast, in livers of Ppara-/-;Bcl6LKO animals, H3K27ac is reestablished or even enhanced at these sites (Figure 5C, top left panel; and Figure 5—figure supplement 2A). Reciprocal H3K27ac patterns were found at impaired fasting-repressed genes in Ppara-/- and Ppara-/-;Bcl6LKO animals (Figure 5C, bottom left panel). This pattern in H3K27ac at BCL6-PPARα sites occurred only at fasting impaired genes that were rescued in Ppara-/-;Bcl6LKO mice (Figure 5—figure supplement 2B). Thus, BCL6 de-repression restores aberrant liver cis-regulatory activity in Ppara-/- mice along fasting responsive genes. Next, we sought to further understand how ablation of hepatocyte Bcl6 could rescue fasting expression defects in Ppara-/- mice. The reestablishment of acetylation at fasting enhancers with BCL6-PPARα sites pointed to a shift in the balance of transcription factor complexes with histone deacetylase (HDAC) and acetyltransferase (HAT) activities at these co-regulated regions. Since hepatocyte BCL6 binds to SMRT/NCoR-HDAC3 at a subset of its binding sites (Figure 3C and D), we specifically examined HDAC3 occupancy at BCL6-PPARα peaks along rescued fasting genes. In the absence of Bcl6, HDAC3 was substantially diminished at these BCL6-PPARα sites (Figure 5D). Additionally, we tested whether BCL6 could influence other PPAR isotypes, which can be associated with CBP/p300 HAT complexes that acetylate H3K27 (Jin et al., 2011). Using qPCR, we found that Ppard levels were significantly increased in fasted Ppara-/-;Bcl6LKO compared to Ppara-/- mice, while Pparg levels were unchanged (Figure 5E). Moreover, BCL6 ChIP-sequencing revealed that BCL6 binds multiple intronic sites along the Ppard gene (Figure 5—figure supplement 2C), suggesting that it directly represses Ppard expression. Consistent with their enhanced Ppard levels, we observed increased PPARδ binding near rescued genes in Ppara-/-;Bcl6LKO compared to Ppara-/- mice (Figure 5C, right panel), particularly at upregulated fasting genes (Figure 5F), including Acot2, (Figure 5G), Hmgcs2, Aldh3a2 (Figure 5—figure supplement 2D), and others (Figure 5—figure supplement 2E). Together, these observations identified that loss of BCL6 directly relieves repression and potentiates PPARδ-mediated transactivation to restore fasting liver gene expression in Ppara-/-;Bcl6LKO mice. Next, we determined the functional impact of the BCL6 regulatory program on hepatic regulation and lipid processing in vivo. 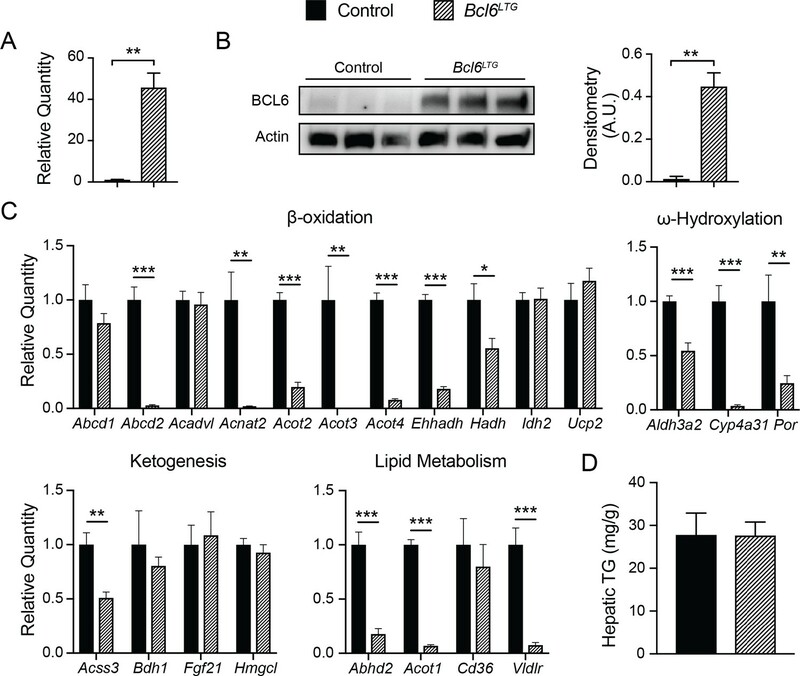 Ad libitum fed Bcl6LKO mice exhibited higher circulating ketone bodies compared to Bcl6fl/fl mice (Figure 6A). This difference persisted after a 24 hr fast. Additionally, mice lacking hepatic Bcl6 have higher rates of complete fatty acid oxidation as measured by oxidation of 14C-palmitate in liver homogenates (Figure 6B). In contrast, analysis of fatty acid uptake, triglyceride secretion, and hepatic lipogenesis based on in vivo deuterium incorporation revealed no other differences in lipid metabolism between Bcl6LKO mice and controls (Figure 6C–E). To test a broader role for BCL6 in lipid processing, we assessed hepatic triglyceride content after feeding mice high-fat diet (HFD) for 19 weeks. Bcl6LKO mice were profoundly protected from developing steatosis, as demonstrated by oil red O staining and more than a 50% reduction in hepatic triglyceride content compared to Bcl6fl/fl controls, despite similar increases in body weight (Figure 6F–H). Accompanying these reductions in hepatic lipid accumulation, HFD-exposed Bcl6LKO mice exhibited significantly lower levels of fasting serum glucose (Figure 6—figure supplement 1A) and a non-significant reduction in insulin (Figure 6—figure supplement 1B). Moreover, when challenged with a shorter term 5-week HFD, Bcl6LKO mice exhibited a trend towards enhanced insulin responsiveness, as measured by levels of phosphorylated AKT following acute administration of exogenous insulin (Figure 6—figure supplement 1C). These combined observations demonstrate that mice lacking hepatic Bcl6 have heightened capacity to catabolize lipids via β-oxidation and subsequent ketogenesis or TCA cycling, as well as improved glucose homeostasis when challenged with high-fat diet. Bcl6 deletion enhances fatty acid oxidation and ameliorates steatosis. (A) Serum β-hydroxybutyrate levels were measured in mice over the course of a 48 hr fast. N = 8–12 per group. (B) Rates of 14C-palmitate oxidation in Bcl6fl/fl and Bcl6LKO liver homogenates measured in CO2 and acid soluble fractions. N = 3 per group. (C) In vivo lipid uptake quantified by bodipy C16 assays in Bcl6fl/fl and Bcl6LKO mice. N = 7 per group. (D) Lipid secretion measured by serum triglyceride sampling over time after injecting Bcl6fl/fl and Bcl6LKO mice with Poloxomer. N = 11–13 per group. (E) In vivo palmitate and stearate synthesis determined by 2H incorporation in Bcl6fl/fl and Bcl6LKO livers. N = 8–10 per group. (F) Oil red O staining in livers, (G) biochemical quantification of liver triglycerides, and (H) % change in body weight in Bcl6fl/fl and Bcl6LKO mice following 19 weeks on 45% high fat diet. N = 7–11 per group. (I) Oil red O staining in livers and (J) biochemical quantification of liver triglycerides from Ppara-/- and Ppara-/-;Bcl6LKO mice following a 48 hr fast. N = 16–18 per group. (K) Rates of 14C-palmitate oxidation in Ppara-/- and Ppara-/-;Bcl6LKO liver homogenates measured in CO2 and acid soluble fractions. N = 4–5 per group. (L) Serum β-hydroxybutyrate levels were measured in mice over the course of a 48 hr fast. N = 8–17 per group. A two-tailed Student’s t-test assuming equal variance was used to compare means between two groups. Data are represented as mean ±SEM. ∗p<0.05, ∗∗p<0.01, ∗∗∗p<0.001. Ppara-/- mice exhibit fasting hypoketonemia and impaired fatty acid oxidation leading to steatosis (Gao et al., 2015; Hashimoto et al., 2000; Kersten et al., 1999; Leone et al., 1999; Montagner et al., 2016). After 48 hr of fasting, Ppara-/- mice developed centrilobular macrosteatosis (Figure 6I), as previously reported (Hashimoto et al., 2000). Remarkably, Ppara-/-;Bcl6LKO animals were strongly protected from hepatic triglyceride accumulation based upon histological analysis with oil red O staining and demonstrated 23% reduced triglyceride accumulation compared to Ppara-/- mice (Figure 6I and J). Compared to fasted Ppara-/- mice, Ppara-/-;Bcl6LKO mice also had higher rates of 14C-palmitate oxidation in liver homogenates, exhibited in both completely oxidized 14CO2 and incompletely oxidized 14C-acid soluble intermediates (Figure 6K). In line with their reduced lipid accrual, Ppara-/-;Bcl6LKO mice also revealed higher ketone body levels (Figure 6L), suggesting that ablation of Bcl6 can de-repress ketone body synthesis even in the absence of Ppara. Overall, these results established that loss of liver Bcl6 rescues metabolic defects of Ppara deficiency. Dynamic transcriptional programming is necessary to sustain life in environments of varying access to food, and the liver is central to orchestrate systemic metabolism in response to such changes. However, our understanding of the epigenomic programs that underpin feeding and fasting metabolism is limited and dominated by studies of hormonally-cued transcriptional activators. 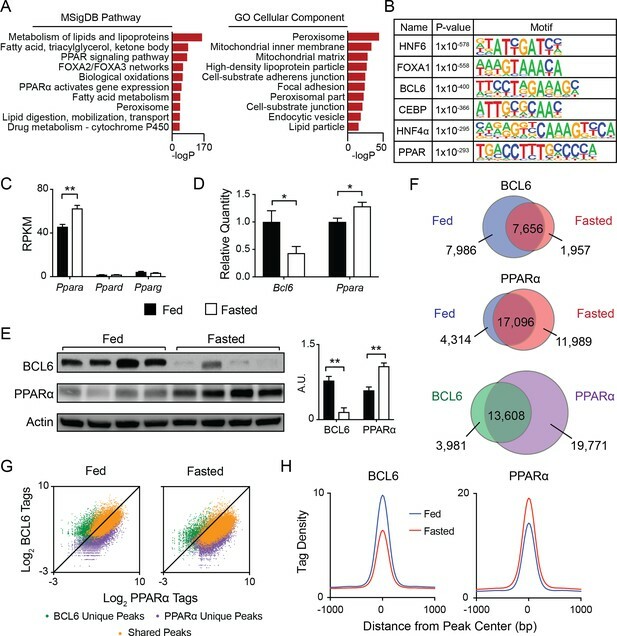 Our work has identified BCL6 as a potent repressor of lipid catabolism, both in the context of fasting and dietary lipid overload. On a genome-wide scale, BCL6 converges with PPARα at over 13,000 regulatory regions on which BCL6 binding is enriched with feeding, whereas PPARα is induced by fasting. This dynamic BCL6-PPARα cis-regulatory module annotates to over 1,400 fasting-responsive genes. Moreover, Bcl6 ablation mimics the fasting transcriptional response, and a myriad of defects in Ppara-/- mice are partially rescued by concomitant deletion of hepatocyte Bcl6, ranging from defective fasting enhancer activity and gene expression to impaired fatty acid oxidation, hypoketonemia, and susceptibility to steatosis. Together, these findings evidence a powerful role for BCL6 to epigenomically oppose PPARα and to suppress fatty acid oxidation. Previously, BCL6 functions outside of hematopoietic cells were poorly defined. In liver, prior analysis supported a role for BCL6 in competing with STAT5 and modulating responses to growth hormone and drug metabolism (Chikada et al., 2018; Zhang et al., 2012). Further, a study of whole-body knockout mice posited a role for BCL6 in systemic metabolism, but it was confounded by analysis limited to animals with severe and frequently fatal inflammatory disease (LaPensee et al., 2014). Original characterization of Bcl6-/- mice demonstrated variable degrees of growth retardation and ill health within three weeks of life, with half dying before 5 weeks of age (Dent et al., 1997). Over 80% of Bcl6-/- mice exhibit myocarditis and over 70% have pulmonary vasculitis with elevated levels of IL-4,–5, and −13, cytokines known to directly impact liver metabolism (Ricardo-Gonzalez et al., 2010; Stanya et al., 2013). Thus, metabolic phenotyping of whole body Bcl6 knockout mice was uninformative (LaPensee et al., 2014), and the role for BCL6 in cell-intrinsic hepatic lipid metabolism was previously unknown. Using genetic, genomic, and isotopic analyses we reveal that loss of Bcl6 in hepatocytes causes cell-autonomous enhancement of fatty acid oxidation without a direct impact on lipid synthesis. Physical interactions between BCL6 and various cofactors have been well documented and in immune cells mediate distinct functional roles (Huang et al., 2014; Huang et al., 2013). Among these interaction partners are SMRT and NCoR, which bind to the BCL6 N-terminal BTB domain and function as scaffolds to recruit HDAC3 and other corepressive machinery (Perissi et al., 2010). In liver, we found nearly 80% overlap between BCL6 and the cistromes of SMRT, NCoR, and HDAC3. Moreover, loss of BCL6 was associated with significantly diminished occupancy of these cofactors at BCL6-bound regulatory regions (Figure 3). However, thousands of SMRT, HDAC3, and particularly NCoR binding peaks were independent of BCL6. Furthermore, even at regulatory regions where BCL6 and these coregulators colocalize, persistent ChIP-seq signals for SMRT, NCoR, and HDAC3 are often observed in the genetic absence of Bcl6. 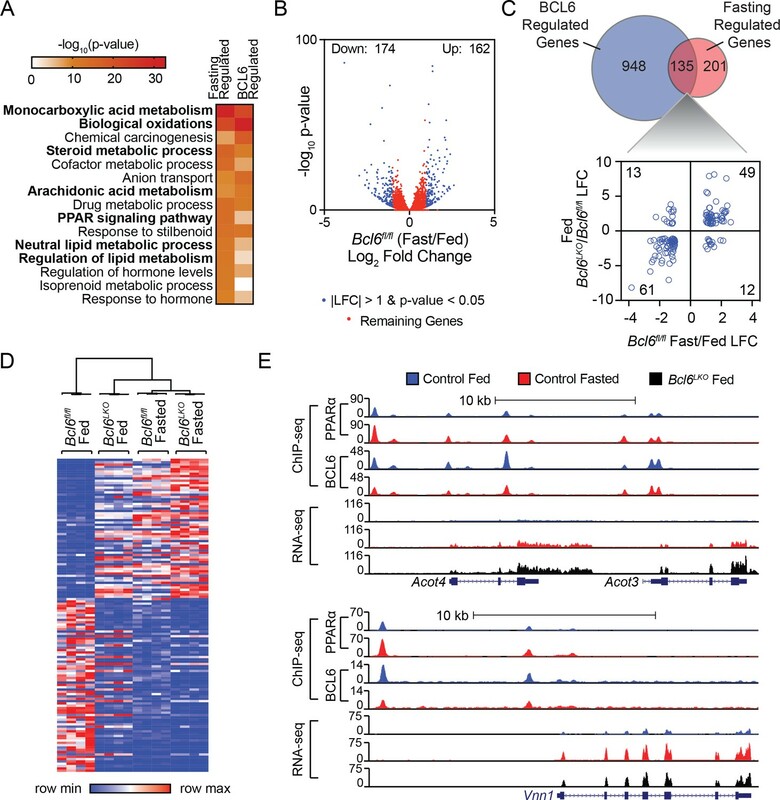 These findings indicate that SMRT, NCoR, and HDAC3 may frequently engage multiple transcription factor complexes within a single regulatory region. Given their extensive interactions, there is tremendous complexity in deciphering corepressor roles in metabolic regulation. Indeed, knockouts and various knockin mutants of NCoR, SMRT, and HDAC3 have demonstrated hepatic steatosis phenotypes (Knutson et al., 2008; Mottis et al., 2013; Shimizu et al., 2015; Sun et al., 2012), in contrast to the lipid overload-protected phenotype observed here with hepatocyte Bcl6 ablation. The cofactor requirements for BCL6-mediated control in the liver and extent to which SMRT/NCoR-HDAC3 are responsible for its potent repression of lipid catabolism warrant further investigation. The clustering of transcription factors at regulatory regions has been proposed as a flexible mechanism to control diverse gene expression patterns during development and in response to environmental stimulus (Arnone and Davidson, 1997; Smith et al., 2013). Motif enrichment indicated a relationship between the BCL6 repressor and the PPAR subfamily of lipid-activated nuclear receptors. PPARα is the predominant PPAR isotype in liver, while PPARδ is expressed at lower levels but was reported to physically interact with BCL6 (Lee et al., 2003). However, we find that Ppara and Ppard are each genetically dispensable for chromatin recruitment of BCL6. Thus, BCL6 opposition to PPARα occurs via proximate binding at independent cis-regulatory elements, a mechanism distinct from FXR, which has been reported to counter PPARα transcriptional outputs through competition for DR1-binding sites (Lee et al., 2014). The regulatory interaction between BCL6 and PPARα is also unique from other integrative regulators of hepatic lipid metabolism such as HNF6 and REV-ERBα, which cooperatively repress transcription via tethering (Zhang et al., 2016). In addition to PPARs, it is possible that other transcriptional activators predicted to converge with BCL6 including HNF6 and HNF4, FOXA1, and C/EBP (Figure 1B), collaborate with BCL6 and PPARα in hepatic lipid regulation (Hayhurst et al., 2001; Zhang et al., 2016). The BCL6-PPARα regulatory module is remarkable for its widespread occurrence along genes controlling lipid catabolism. We speculate that BCL6-PPAR elements in fasting enhancers endow them with variably repressive or activating regulatory potential, contributing to highly dynamic gene expression across the feeding to fasting transition. In a related manner, genetic ablation of Bcl6 de-represses these regulatory regions and compensates for loss of PPARα transactivity in Ppara-/-;Bcl6LKO mice. Remarkably, this occurs both directly, via loss of active repression at BCL6-PPAR elements, and indirectly by upregulating Ppard to enhance transactivity at BCL6-PPAR sites. Thus, we find that liver metabolic shifts are not simply directed by inducible transactivating factors. Rather, ‘active repression’ (Hanna-Rose and Hansen, 1996) by BCL6 and its dynamic modulation play key additional roles in toggling between the fed and fasted state and determining hepatic lipid accumulation. Since inhibitors of BCL6 have been developed to target BCL6 and selective interactions with its corepressors (Cardenas et al., 2016; Lu et al., 2018), these findings also raise the possibility that BCL6 de-repression could represent a future therapeutic strategy for non-alcoholic fatty liver disease. Bcl6fl/fl mice were generated through the UC Davis Mouse Biology Program by engineering loxP sites between exons 5 and 6 of the mouse Bcl6 locus. Cre-mediated deletion creates a frameshift mutation, resulting in a protein of 138 amino acids (compared to 708 amino acids in wild-type BCL6) lacking exons 5–10 and the zinc finger DNA binding domain. Ppara-/- (Stock #008154) and Ppardfl/fl (Stock #005897) mice were obtained from Jackson Laboratories. Bcl6fl/fl and Ppardfl/fl mice were crossed with Albumin-Cre animals (Jackson Laboratories, Stock #003574) to generate Bcl6fl/fl; Albumin-Cre (Bcl6LKO) and Ppardfl/fl; Albumin-Cre (PpardLKO) mice, respectively. Mice were maintained on a 14:10 light: dark (LD) cycle with free access to water. Unless otherwise specified, ‘fed’ refers to ad libitum feeding with standard chow and ‘fasted’ refers to a 16–18 hr overnight fast. High-fat diet containing 45% of kcal from fat was obtained from Research Diets, Inc (Stock #D12451). All animal care and use procedures were conducted in accordance with regulations of the Institutional Animal Care and Use Committee at Northwestern University. Chromatin immunoprecipitation (ChIP) was performed as previously described (Barish et al., 2010). ChIP samples were prepared in biological triplicate (three animals per condition), unless otherwise specified. Mouse livers were harvested, rinsed in PBS, and crosslinked at room temperature for 30 min in 2 mM disuccinimidyl glutarate and then for 10 min in 1% formaldehyde. After quenching with 125 mM glycine, crosslinked material was rinsed twice with cold PBS and frozen at −80°C until further processing. Crosslinked material was lysed in buffer containing 0.75M NaCl, 1% Triton X, 0.5 mM Tris, 0.05 mM EDTA, and 0.5% NP-40. Isolated nuclei were then sheared in buffer containing 1% SDS, 10 mM EDTA, and 50 mM Tris for six cycles (30 s on, 30 s off) using a Diagenode Bioruptor to shear chromatin into 200–1000 bp fragments. Protein-DNA complexes were incubated overnight with antibody against BCL6 (custom polyclonal to mouse BCL6), PPARα (Santa Cruz), PPARδ (custom polyclonal to mouse PPARδ) (Fan et al., 2017), SMRT (custom polyclonal to mouse SMRT) (Barish et al., 2012), NCoR (custom polyclonal to mouse NCoR) (Barish et al., 2012), HDAC3 (Santa Cruz) or H3K27ac (Active Motif). Antibody complexes were precipitated with IgG paramagnetic beads (ThermoFisher) for ChIP-seq or Protein A agarose beads (Millipore) for ChIP followed by qPCR. DNA was decrosslinked and purified using MinElute PCR purification columns (Qiagen). ChIP DNA was either assessed via qPCR and expressed as percent recovery of input chromatin or further processed into libraries for ChIP-seq. See Supplementary file 1 for ChIP qPCR primers. To characterize enriched motifs near BCL6-binding sites, we used HOMER’s ‘findMotifsGenome.pl’ command to scan 50 bp windows surrounding BCL6 peaks, including the -mask option compared to random whole genome sequences. Motif densities were then quantified using HOMER’s ‘annotatePeaks.pl’ using known motifs for PPARE, RXR, LXRE, and FXR; the BCL6 motif displayed in the density plots was identified with HOMER’s de novo motif discovery tool using 200 bp scanning windows surrounding BCL6 peaks. Motif finding near SMRT, NCoR, and HDAC3 peaks used a 200 bp scanning window; the top 20 motifs by p-value were included in the heatmap. Enriched motifs were identified in all peaks for each factor compared to random whole genome sequences. Peak sets were then each compared to BCL6 to identify enriched motifs at shared sites against DNA sequences from unique sites. Conversely, for each cofactor, enriched motifs were identified at unique sites compared against DNA sequences from peaks shared with BCL6. To generate the tag density scatter plots and histograms, tags were quantified using HOMER’s ‘annotatePeaks.pl’ command, with either ‘-size 400’ option or ‘-size 2000 -hist 25’ options, for scatter plots and histograms, respectively. HOMER’s ‘mergePeaks’ was used to compare different peak sets, defining overlapping peaks as those with a maximum distance between peak centers of 200 bp. BigWig browser tracks were generated using HOMER’s ‘makeMultiWigHub.pl’ program and then viewed on the UCSC Genome Browser (Kent WJ et al., 2002). Gene ontologies for ChIP-seq data were generated using GREAT (McLean et al., 2010) by annotating ChIP-seq peaks to the single nearest gene. To calculate distance between BCL6 and PPARα peaks, the distance between each BCL6 peak and the nearest PPARα peak was calculated using HOMER’s ‘annotatePeaks.pl’ command and the ‘-pdist’ option. Distances < 200 bp were plotted in a histogram where each bin represents increasing increments of 10 bp. The four-way Venn was generated using Intervene (Khan and Mathelier, 2017). Liver samples (<30 mg) were stored in 1 mL of RNAlater Stablization Solution (Ambion) at −80° immediately following harvest. To isolate total RNA, tissues were homogenized in 1 mL buffer RLT (Qiagen) using the Mo Bio Powerlyzer. RNA was isolated and purified using RNeasy columns according to the manufacturer’s protocol (Qiagen). RNA quality was assessed using a Bioanalyzer (Agilent) to ensure a RIN score greater than 7.0. Sequencing libraries were constructed from purified RNA using the KAPA Stranded RNA-seq Kit with RiboErase (HMR) according to the manufacturer’s instructions. Libraries were quantified using both a Bioanalyzer (Agilent) and qPCR-based quantification (Kapa Biosystems) and sequenced on an Illumina NextSeq 500 instrument using 75 bp single-end reads. RNA raw sequence reads were aligned to a reference genome (mm10) using STAR version 2.4.0 hr (Dobin et al., 2013). Aligned reads included only unique mappers and those with fewer than four mismatches. Gene expression at exons was quantified using HOMER (Heinz et al., 2010). Differentially expressed RNAs were then normalized and identified using DESeq2 version 1.14.1 (Love et al., 2014) with an adjusted FDR < 0.05. Direct comparisons were made between Bcl6fl/fl fed and fasted animals, as well as between fed Bcl6fl/fl and Bcl6LKO animals to generate lists of differentially expressed genes. To compare the BCL6 cistrome and transcriptome, BCL6 ChIP-seq peaks were annotated to the nearest transcription start site using ‘annotatePeaks.pl’ in HOMER and then grouped based on the liver gene expression change of the annotated gene in Bcl6LKO mice compared to Bcl6fl/fl controls. Peaks were grouped as ‘repressed,’ ‘activated,’ or ‘unchanged’ BCL6 peaks if gene expression was higher, lower, or unaffected in Bcl6LKO, respectively. To determine ‘rescued’ gene expression in Ppara-/-;Bcl6LKO animals, impaired gene expression in Ppara-/- animals was first defined. To do this, we first identified genes that were significantly changed (adjusted p-value<0.05) with fasting in Bcl6fl/fl control animals. Then, among genes normally upregulated with fasting, we identified genes that were significantly less expressed (adjusted p-value<0.05) in fasted Ppara-/- compared to fasted control mice. Similarly, we identified genes normally downregulated with fasting that were significantly more expressed in fasted Ppara-/- compared to control fasted mice. Collectively, these significantly different up- and downregulated genes represent dysregulated genes in fasted Ppara-/- mice. To then determine rescued gene expression in Ppara-/-;Bcl6LKO animals, we identified dysregulated Ppara-/- genes that demonstrated no significant difference in gene expression between control fasted mice and Ppara-/-;Bcl6LKO fasted mice, indicating a restoration of fasting gene expression to control levels. We also identified partially rescued gene expression. Upregulated fasting genes with significantly lower expression in fasting Ppara-/- animals were considered partially rescued if fasting Ppara-/-;Bcl6LKO gene expression was significantly higher than Ppara-/- but also still significantly lower than control gene expression. Similarly, downregulated fasting genes with significantly higher expression in fasting Ppara-/- animals were considered partially rescued if fasting Ppara-/-;Bcl6LKO gene expression was significantly lower than Ppara-/- but also still significantly higher than control gene expression. Gene ontology analysis was performed on differential genes with an adjusted p-value<0.05 and a log fold change greater than one using Metascape (Tripathi et al., 2015). Enrichment analysis included terms from Reactome Gene Sets, GO Biological Processes and KEGG Pathways. RPKM values were generated using HOMER (Heinz et al., 2010) and displayed as heatmaps using Morpheus (Gould, 2019). The distance matrix heatmap was generated using the ‘dist’ function in R version 3.4.3 (R Development Core Team, 2017) and plotted with the heatmap.2 function and the ‘RColorBrewer’ package (Neuwirth, 2014). To generate the heatmap of H3K27ac and PPARδ enrichment at BCL6-PPARα peaks near rescued genes, relevant BCL6-PPARα-bound regions were identified by annotating peaks to the nearest transcription start site using HOMER. H3K27ac ChIP-seq enrichments in fasted control, Ppara-/- and Ppara-/-;Bcl6LKO samples were then quantified at these peaks using ‘annotatePeaks.pl’ and the ‘-size 6000 -hist 25 -ghist’ options; PPARδ ChIP-seq enrichment was quantified using ‘-size 3000.’ The signal averages across biological replicates were plotted as a heatmap using Morpheus. All UCSC genome browser tracks represent combined tag directories across replicates. Genes differentially expressed with fasting were classified based on their association with regulatory regions. First, shared BCL6-PPARα ChIP-seq peaks were annotated to the single nearest gene using HOMER. Using these annotations, genes differentially expressed with fasting (adjusted p-value<0.05) were then grouped based on presence or absence of a nearby shared BCL6-PPARα annotated peak. Of those differential fasting genes without an annotated shared BCL6-PPARα peak, genes were further grouped based on presence of annotated BCL6 unique and PPARα unique ChIP-seq peaks. Some genes had both BCL6 unique and PPARα unique peaks, but these were non-overlapping. Other genes had neither BCL6- nor PPARα-annotated peaks nearby. The frequency of BCL6-PPARα, PPARα only, or BCL6 only peaks per fasting gene was also calculated. Frozen liver tissues were homogenized in Trizol (Ambion) using a Mo Bio Powerlyzer. Chloroform was added at 200 μL to 1 mL homogenates in Trizol. The clear aqueous phase was extracted after centrifugation. RNA was then isolated with a RNeasy kit (Qiagen), according to manufacturer’s protocol. cDNA was synthesized with 600–1000 ng of RNA using the iScript cDNA Synthesis Kit (BioRad). Gene expression was then assessed via qPCR using iTaq Universal SYBR Green Supermix (BioRad). Gene expression was normalized to the housekeeping gene, 36b4. See Supplementary file 2 for primer sequences. For the hematoxylin and eosin (H & E) staining, liver tissues were fixed in 10% formalin overnight and then moved to 70% EtOH. Fixed tissues were paraffin embedded, cut, and stained by the Northwestern University Research Histology and Phenotyping Laboratory which is supported by NCI P30-CA060553 awarded to the Robert H. Lurie Comprehensive Cancer Center. For oil red O staining, liver samples frozen in OCT were cut to 5–7 μm with a Leica cryostat, mounted onto slides, stained with oil red O, and counterstained with hematoxylin. We measured serum triglycerides (Infinity Thermo Fisher) and ketone bodies (Cayman Chemical) using commercial kits. To measure tissue triglycerides, we extracted lipids using a modified version of the Folch Method (Folch et al., 1957). In brief, tissues were homogenized in 1 mL of methanol using the Mo Bio Powerlyzer. Homogenates were transferred to glass tubes and incubated several hours in 1:2 methanol:chloroform after briefly vortexing. 0.9% NaCl was added to homogenates overnight to separate the chloroform lipid-containing layer from the methanol layer. The next day, the methanol and any floating tissue was aspirated. The remaining chloroform layer was dried under nitrogen gas. Lipid was resuspended in 2-propanol and quantified using the Infinity Thermo Fisher triglyceride kit. Quantified lipid was normalized to tissue weight. Serum insulin was measured via ELISA (Crystal Chem) and serum glucose was measured using a colorimetric assay (BioVision). We fasted mice for 4 hr and then injected mice intraperitoneally with a 7.5% poloxamer solution in PBS at a dose of 1 mg/g body weight. Tail-vein blood samples were collected over time using capillary Microvettes (Sarstedt). The rate of hepatic lipogenesis was determined via incorporation of 2H into newly made TG-bound fatty acids, as described elsewhere (Bederman et al., 2006). Briefly, mice were injected i.p. with 0.7 mL of 2H-labeled saline (9 g of NaCl in 1 L of 99.9% 2H2O). For the next 24 hr, mice were maintained on 6% 2H-labeled drinking water and then harvested. Terminal serum and liver tissue samples were collected and flash frozen. Sample processing and GC/MS analysis was performed as described previously (Bederman et al., 2012). We determined rates of fatty acid oxidation in liver homogenates by measuring oxidation of 14C palmitate (Hirschey and Verdin, 2010). Briefly, tissue was dounce homogenized in sucrose/Tris/EDTA buffer and incubated for 30 or 60 min in a reaction mixture containing 0.4 uCi 14C palmitate. After reacting with the labeled palmitate, mixtures were transferred to tubes containing 1M perchloric acid with Whatman paper discs soaked in 1M NaOH in the lids. Scintillation counting was used to measure 14C in the acid-soluble fraction and in disc-trapped CO2, representing partially and fully oxidized radiolabeled palmitate, respectively. Fatty acid oxidation rates were then expressed as amount of substrate oxidized per tissue weight per minute. Mice were injected with BODIPY-C16 (Life Technologies) to assess lipid uptake, as described elsewhere (Wilson et al., 2016). BODIPY-C16 was resuspended in dimethylsulfoxide at 10 mM. Then, a 0.1 μg/μL working stock was made in 0.25% fatty-acid-free BSA (Sigma-Aldrich) solution in PBS. Mice were fasted for 4 hr and then injected intraperitoneally with BODIPY-C16 at 0.5 μg/g of body weight. After 5 hr, tissues were collected and flash frozen. 80–120 mg of liver tissues were dounce homogenized in RIPA buffer. 25 μL volumes of cleared tissue homogenates were diluted 1:4 in PBS and analyzed using a fluorescent plate reader (Ex 485 nm, Em 515 nm). Saline-injected mouse liver homogenates were used to control for background fluorescence. Tissue fluorescence was normalized to tissue weight. Mice were placed on 5 weeks of high-fat diet. After a 5 hr fast, mice were injected intraperitoneally with 1 U/kg recombinant insulin. Ten minutes later, mice were sacrificed and their tissues were harvested. Frozen liver tissues were dounce homogenized in RIPA buffer. After incubating on ice for 10 min, homogenates were centrifuged at full speed for 15 min at 4°; supernatant was then collected and stored at −80°. Protein was quantified with a BCA assay (Thermo Scientific) and 2 μg/μL lysates were boiled for 5 min in 5x loading buffer. Denatured protein lysates were loaded in precast polyacrylamide gels (BioRad) and transferred to PVDF membranes (BioRad). Membranes were blocked with 5% milk in PBST and probed with primary antibodies for BCL6 (Santa Cruz, D-8) at 1:200, PPARα (Santa Cruz, H-98) 1:500, pAKT (Cell Signaling, 4060) 1:1000, panAKT (Cell Signaling, 4691) 1:1000 or β-actin (Sigma, A1978) 1:1000 overnight at 4°. Secondary antibodies were added for 1 hr at room temperature (Jackson ImmunoResearch). Protein was then visualized using ECL (ThermoScientific). MemCode Reversible Stain was used to visualize total protein (Thermo Fisher Scientific). Protein densitometry was quantified using ImageJ 1.51 s (Schneider et al., 2012). All RNA-seq and ChIP-seq data are deposited in GEO SuperSeries accession #GSE118789. American Journal of Physiology-Endocrinology and Metabolism 290:E1048–E1056. American Journal of Physiology-Gastrointestinal and Liver Physiology 303:G507–G518. Journal of Clinical Investigation 126:3351–3362. Laboratory Investigation; a Journal of Technical Methods and Pathology 98:1500–1511. The American Journal of Pathology 185:1396–1408. Trends in Endocrinology & Metabolism 26:699–710. Journal of Biological Chemistry 275:28918–28928. Molecular and Cellular Biology 21:1393–1403. Journal of Clinical Investigation 109:1125–1131. Journal of Molecular Biology 3:318–356. Journal of Clinical Investigation 103:1489–1498. R: A language and environment for statistical computing, Vienna, Austria, https://www.r-project.org/. Molecular and Cellular Biology 35:555–565. Journal of Clinical Investigation 123:261–271. Molecular and Cellular Biology 32:880–896. Thank you for submitting your article "Dynamic repression by BCL6 controls the genome-wide liver response to fasting and steatosis" for consideration by eLife. Your article has been reviewed by three peer reviewers, one of whom is a member of our Board of Reviewing Editors, and the evaluation has been overseen by Mark McCarthy as the Senior Editor. The reviewers have opted to remain anonymous. Sommars and colleagues focused on the role of the transcriptional repressor BCL6 in the regulation of hepatic lipid metabolism. The authors report that BCL6 acts as an antagonist of the PPARalpha transcriptional program, and inhibits the transcriptional signature induced in liver by fasting. They demonstrate that BCL6 and PPARalpha bind independently to many regulatory regions. The authors also show that BCL6 liver knockout mice activate a transcriptional program resembling the fasting-induced response, including changes in genes linked to increased lipid β-oxidation and ketogenesis. Accordingly, hepatic deletion of BCL6 was shown to protect mice from HFD-induced steatosis. 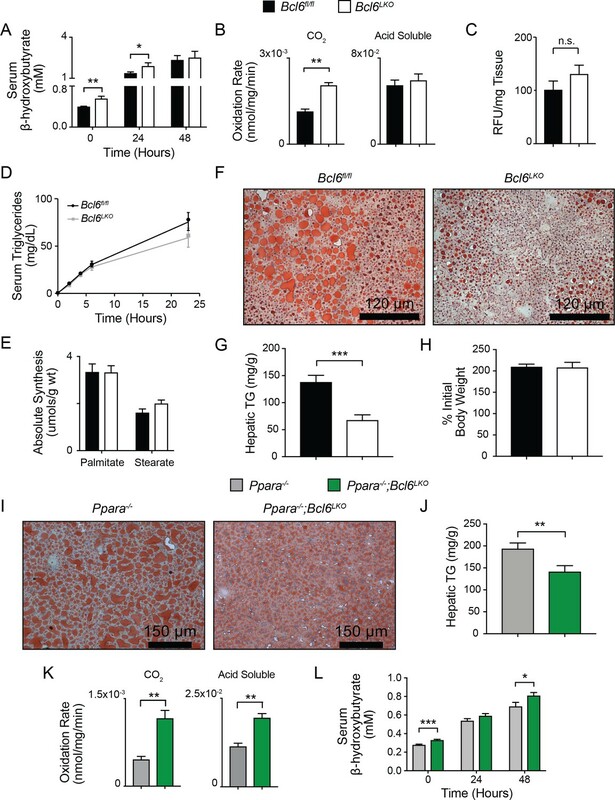 The authors also demonstrate that BCL6 deletion in liver of PPARα knockout mice reverses the impaired response to fasting and ameliorates fasting-induced hepatic lipid accumulation. Overall, the reviewers found the study to be well done and the findings to be of broad interest. The reviewers also identified several points that should be further explored in order to strengthen the conclusions of the manuscript. 1) Bcl6 ablation rescues fasting gene expression defects in PPARa -/- mice. In this setting, what is driving the fasting transcriptional program? Do the authors have any hypotheses about this that can be tested experimentally? 2) Since the genome-wide DNA binding of BCL6 and PPARa are mutually independent and in Discussion the authors propose that BCL6 opposition to PPARa occurs via proximate binding at independent cis-regulatory elements, it would be helpful to plot the genomic binding sites of BCL6 surrounding the nearby PPARa sites or the other way around. Do the BCL6 and PPARa sites overlap? Are these factors competing with one another physically? 3) In Figure 4A, are there any unique feature of genes that cannot be restored expression upon fasting in Ppara-/-; Bcl6 LKO mice? 4) If the experiment is feasible in a two-month time frame, it would be interesting to know What happens if you overexpress BCL6 in a fasted mouse? Does this cause a reduction of fatty acid oxidation? Such an experiment would enhance the paper, but it is not considered essential for publication. 5) In Figure 5F and 5G, the attenuation of steatosis in 19-week of HFD-fed Bcl6 LKO mice is a very positive finding. Have the authors checked to see if there is any effect on the HFD-induced glucose intolerance and insulin resistance of these mice? 6) It is known that BCL6 acts as a transcriptional repressor by interacting with many co-repressors, including SMRT, NCoR and HDACs. It is known that NCoR1 and SMRT are involved in regulation of lipid metabolism in liver, as their ablation causes hepatic steatosis (Shimizu et al., 2015). Do the authors have any insight into the molecular mechanism by which BCL6 represses transcription in liver? We thank the reviewers for this important question. Rescued genes in Ppara-/-;Bcl6LKO fasted livers are significantly more likely to be associated with regulatory regions containing BCL6-PPARa binding sites. Accordingly, to address how fasting gene expression defects can be rescued, we have focused on understanding epigenomic regulation at these regions. We mapped acetylated H3K27 (a marker for enhancer activity) in Ppara-/- and Ppara-/-;Bcl6LKO fasted livers. We found that H3K27ac was increased at enhancers associated with upregulated rescued genes, but it was not changed at non-rescued genes. (Figure 5C and Figure 5—figure supplement 2B). These results implied that reduced histone deacetylase (HDAC) activity, increased histone acetyltransferase (HAT) activity, or possibly both changes at BCL6-PPARα regulatory regions could underlie the rescued fasting expression observed in Ppara-/;Bcl6LKO animals. BCL6 functions as a repressor and can complex with various HDACs, including HDAC3 (as demonstrated in Figure 3C and D). We found that HDAC3 recruitment to shared BCL6-PPARα sites along rescued genes was significantly diminished with loss of Bcl6 (Figure 5D). Of note, although BCL6 levels are reduced with fasting, BCL6 still retains ~50% of its genome-wide occupancy under these conditions (Figure 1H and Figure 1—figure supplement 2A). Compared to fasting Ppara-/- mice, complete Bcl6 ablation in Ppara-/-;Bcl6LKO mice is expected to cause a further decline in HDAC3 occupancy on BCL6-PPARα-controlled fasting enhancers. Thus, loss of BCL6 repression and associated HDACs is likely to increase fasting enhancer activity and the expression of associated genes. Ppara-/- and Ppara-/-;Bcl6LKO livers. However, we did not find enhanced recruitment of STAT5 to BCL6-PPARα shared enhancers near rescued genes (Author response image 1A-B). Loss of BCL6 does not enhance STAT5 recruitment to shared BCL6-PPARα enhancers. (A) STAT5 ChIP-seq tag density in Ppara-/- and Ppara-/-;Bcl6LKO livers at BCL6-PPARα peaks near rescued upregulated and downregulated fasting genes. ChIP was performed in biological triplicate. (B) Heatmap of STAT5 ChIP-seq in fasted control Bcl6fl/fl, Ppara-/-, and Ppara-/-;Bcl6LKOmice at BCL6-PPARα shared peaks that annotate to rescued Ppara-/-dysregulated genes in Ppara-/-;Bcl6LKO mice. Since PPARα and PPARδ compete for binding at shared sites (Figure 2 —figure supplement 1C), we tested whether enhanced recruitment of PPARδ to shared BCL6-PPARα regions might drive expression of fasting genes in the combined absence of Ppara and Bcl6. Notably, we observed that Ppard expression is higher in fasted Ppara-/;Bcl6LKO mice compared to Ppara-/- mice (Figure 5E), and BCL6 binds along the Ppard gene (Figure 5—figure supplement 2C). These results indicated that BCL6 directly represses Ppard expression. We performed ChIP-sequencing and found that PPARδ binding was enhanced at shared BCL6-PPARα sites near rescued genes in fasting Ppara-/-;Bcl6LKO mice compared to wild type control or Ppara-/- livers (Figure 5C and F), particularly at fasting upregulated genes. Thus, loss of Bcl6 facilitates compensation for PPARα deficiency via PPARδ. In summary, we believe that the rescued fasting expression observed in Ppara-/-;Bcl6LKO mice is achieved both through reduced BCL6-mediated repression and enhanced activation by PPARδ at BCL6-PPARα controlled fasting enhancers. Thank you for this suggestion. We have now included a histogram plotting the distance between BCL6 peaks and the nearest PPARα peak center (Figure 1—figure supplement 2). We find that even within a 200-bp window, >96% of BCL6 and PPARα peak centers are within 100 bp of each other. Despite their close proximity, we find no evidence that these factors are competing with each other physically. Their consensus sites are distinct (Figure 1B), and genetic ablation of either factor does not alter chromatin recruitment of the other factor (Figure 2A and Figure 1—figure supplement D-E). The reviewers raise a very interesting question. It should be noted that in our revised manuscript, Figure 4A has now become Figure 5A. We have found several epigenomic features that typify the regulatory regions associated with genes that cannot be restored compared to those that can rescued.Unrestorable features include (i) static H3K27 acetylation, (ii) relatively modest recruitment of PPARδ, (iii) stronger PPARα binding, (iv) lack of BCL6 binding sites, and (v) distinct motif enrichments. We detail these features below. i) As discussed in Question #1, we found that enhancer activity correlates to transcriptional rescue. H3K27ac marks were relatively unchanged near non-rescued genes (Figure 5—figure supplement 2B). In contrast, H3K27ac was increased near rescued upregulated genes or reduced at rescued downregulated genes (Figure 5C). ii) A potential contributor to these differences in H3K27 acetylation is PPARδ recruitment. Rescued fasting genes are associated with increased PPARδ binding in Ppara-/-;Bcl6LKO mice (Figure 5F). At non-rescued genes, we also observe PPARδ recruitment to nearby BCL6-PPARα binding sites in Ppara-/-;Bcl6LKOanimals (Author response image 2A), but the magnitude of the increase in PPARδ binding is significantly less than at rescued genes (Author response image 2B). iii) We observed that PPARα binding strength influences whether a gene can be rescued. We have analyzed PPARα binding strength on binding sites of rescued versus nonrescued genes based on our ChIP-sequencing data in wild type mice (Author response image 2C). PPARα binding is stronger at its peaks near non-rescued genes compared to rescued genes, particularly under fasting conditions. Thus, Bcl6 ablation may be insufficient to upregulate genes with particularly strong PPARα-dependence. iv) Although BCL6 binding strength is not different among rescued versus non-rescued genes (Author response image 2C), genes that are restored in Ppara-/-mice by Bcl6 ablation are significantly more likely to have a nearby BCL6 binding site than to lack such sites. This indicates an important role for relief of BCL6-mediated active repression to rescue defective expression in Ppara-/- mice. v) Additionally, differential recruitment of other transcription factors to nearby enhancers may influence which genes are rescued with loss of Bcl6. We identified all active enhancers that map to rescued or non-rescued genes in Ppara-/-;Bcl6LKO mice by annotating H3K27ac ChIP-seq peaks to their nearest transcription start sites and performed motif analysis of these distinct sets of regulatory regions. Using non-rescued enhancers as background, we identified enriched motifs for homeobox family transcription factors (NKX6.1, PITX1), heat shock factor, ZBTB18, and FOXO near rescued genes (Author response image 2D). In contrast, using rescued enhancers as background, we identified motifs for MYB, NR5A2 (LRH-1), E2F1, ZNF675, and OCT4 in enhancers near non-rescued genes. 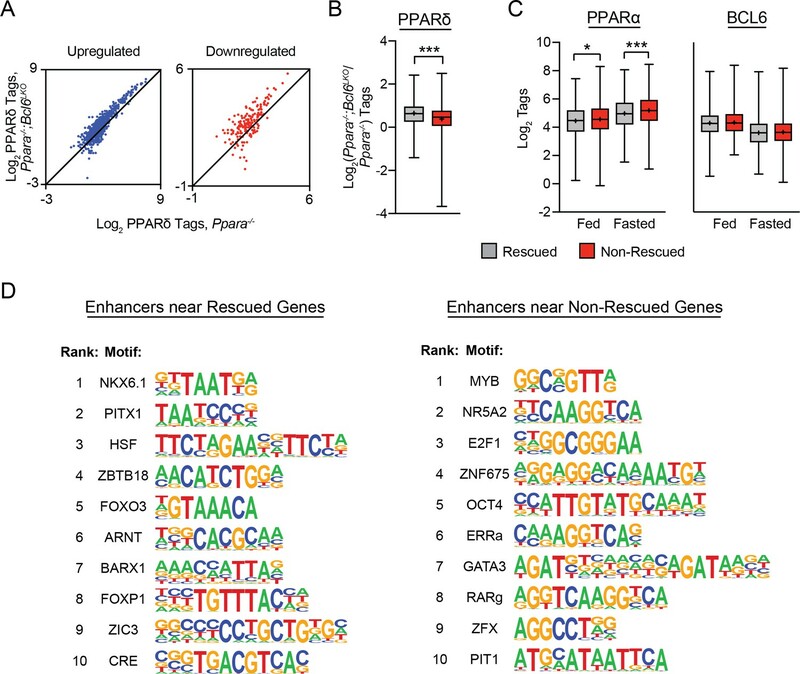 Rescued genes are enriched for nearby PPARδ binding and motifs for distinct transcription factors compared to non-rescued genes. (A) PPARδ ChIP-seq tag density in Ppara-/- and Ppara-/-;Bcl6LKO livers at shared BCL6-PPARα peaks near up- and downregulated non-rescued fasting genes. (B) Log2 ratio of PPARδ ChIP-seq tag density in Ppara-/-;Bcl6LKO over Ppara-/- livers at BCL6-PPARα peaks near rescued and non-rescued fasting genes. (C) PPARα tag density (left) and BCL6 tag density (right) in control fed and fasted livers at respective peaks near rescued and non-rescued genes. (D) Top 10 enriched motifs at enhancers identified by H3K27ac ChIP-seq in fasted Ppara-/-;Bcl6LKO livers near rescued (left) and nonrescued (right) genes. Motifs near rescued genes were identified against DNA sequences in non-rescued enhancers; motifs near non-rescued genes were identified against DNA sequences in rescued enhancers. Box plots display interquartile range (box), median (horizontal line), mean (black ‘+’), and min to max (whiskers). Mann-Whitney test was used to compare tags between groups. p < 0.05, p < 0.01, p < 0.001. To explore the effects of Bcl6 gain-of-function, we have very recently developed a Rosa locus transgenic model to constitutively overexpress Bcl6 in mouse liver. In fasting mice, transgenic animals (Bcl6LTG mice) express 40-fold higher levels of Bcl6 RNA, and protein levels are approximately 35-fold higher than in wild type controls (Author response image 3A and B). We find that many lipid metabolism genes which were upregulated by genetic ablation of Bcl6 are reciprocally downregulated by overexpressing Bcl6 (Author response image 3C). However, when placed on a 48-hour fast, Bcl6LTG mice did not exhibit a difference in liver triglyceride accumulation (Author response image 3D). Given the promising changes in gene expression, we hypothesize that a more extended lipid challenge may reveal a phenotype. We plan to perform high fat diet studies in the future to test whether Bcl6overexpression may exacerbate steatosis in that context. Overexpression of BCL6 downregulates fatty acid oxidation genes. (A) qPCR analysis of Bcl6 in control and Bcl6LTG livers. N = 3-7 per group. (B) Western blot of BCL6 protein in control and Bcl6LTG livers. Densitometric quantification is shown normalized to actin (right). (C) qPCR analysis of fatty acid oxidation and ketogenesis genes after a 48-hour fast. N = 6-7 per group. (D) Hepatic triglyceride content after a 48-hour fast. N = 67 per group. A two-tailed Student’s t-test assuming equal variance was used to compare mean values between groups. Data are represented as mean ± SEM. p < 0.05, p < 0.01, p < 0.001. We have tested fasting serum glucose and insulin levels after 17 weeks of high fat diet. We found that glucose was significantly lower and insulin trended lower in mice lacking Bcl6 (Figure 6—figure supplement 1A and B). To further explore whether protection from hepatic triglyceride accumulation improved insulin sensitivity, we placed mice on a shorter term of high fat diet (5 weeks) and then measured insulin signaling in vivo. We injected mice with insulin (1 unit/kg), harvested their livers after ten minutes, and then performed western blots to measure total and phosphorylated-AKT (p-AKT). 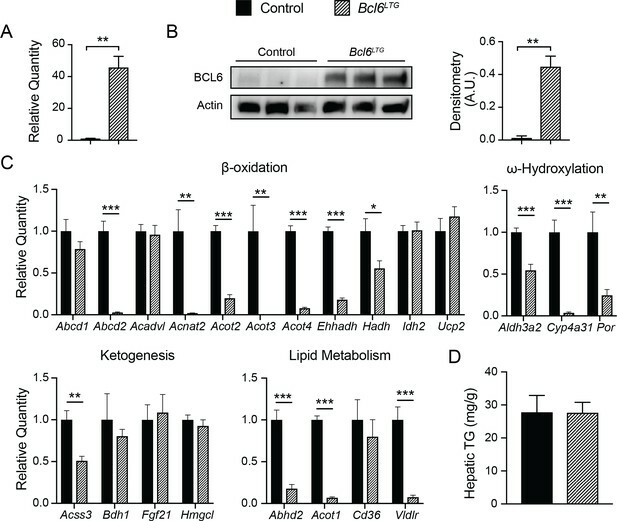 Bcl6LKO mice exhibited higher levels of p-AKT and ratios of p-AKT to total AKT, suggesting improved hepatic insulin sensitivity (Figure 6—figure supplement 1C). We thank the reviewers for this important question. It is intriguing that known BCL6 corepressors can be involved in very different lipid metabolic effects in liver. As the reviewers point out, disrupting NCoR interactions with nuclear receptors and globally disrupting SMRT interactions caused steatosis in the referenced manuscript. Likewise, deletion of liver Hdac3 has been reported to cause steatosis (Sun et al., 2012). To better understand the mechanism of repression by BCL6 in liver, in our revised manuscript we have performed ChIP-sequencing of SMRT, NCoR, and HDAC3 in control and Bcl6LKO livers from ad lib fed mice using three biological replicates per condition. We produced robust datasets for analysis of these corepressors and their interactions with BCL6. We found extensive overlap between BCL6 and all three corepressors, with nearly 80% of BCL6 sites overlapping with SMRT, NCoR, or HDAC3, and nearly 40% of BCL6 sites overlapping with all three (Figure 3C). Moreover, in the genetic absence of Bcl6, we found that these cofactors exhibited significantly reduced recruitment to regions with BCL6 binding sites (Figure 3D), which was accompanied by increased H3K27 acetylation (Figure 3—figure supplement 2B). Together, these results provided evidence that liver BCL6 recruits SMRT/NCoR and HDAC3 to repress a subset of its cis-elements. However, BCL6 binds to 3,728 sites independently of SMRT, NCoR, or HDAC3, and these corepressors bind to thousands of regions independently of BCL6 (Figure 3C). This was particularly apparent for NCoR, which exhibited over 35,000 binding sites in liver. These results suggest that BCL6 and SMRT/NCoR-HDAC3 can regulate independent transcriptional networks. Importantly, even with Bcl6 ablation, residual corepressor binding of SMRT, NCoR, and HDAC3 is apparent on regions to which BCL6 is normally bound (Figure 3D). This implies that SMRT, NCoR, and HDAC3 may frequently engage multiple transcription factor complexes within a single regulatory region. Given that SMRT, NCoR, and HDAC3 can interact with many different transcription factors (Figure 3—figure supplement 2), it is perhaps not surprising that phenotypes for these corepressor knockouts are quite different than the phenotype observed here in Bcl6LKO mice. In the future, we hope to further define BCL6 corepressor complexes in liver and the contribution of SMRT/NCoR-HDAC3 to BCL6-mediated lipid regulation. Additionally, to gain insight into gene regulation by BCL6 and SMRT/NCoR-HDAC3, we compared the transcriptional effects of Bcl6 deletion to Smrt-NCoR or Hdac3 deletion by comparing the our BCL6 RNA-seq data to other published datasets (Shimizu et al., 2015; Sun et al., 2012). We found 799 genes differentially expressed (p-value < 0.05) with both Bcl6 deletion and SmrtKO-Ncor RID double deletion (DKO)(Author response image 4A). Among these, we identified four gene expression categories (up in Bcl6LKO/up in DKO; up in Bcl6LKO/down in DKO; down in Bcl6LKO/up in DKO; down in Bcl6LKO/down in DKO). Using these four categories, we performed a clustering analysis of enriched gene ontologies. Quite interestingly, we found that genes downregulated in Bcl6LKO mice and upregulated in DKO mice were enriched for functions in fatty acid biosynthesis (Author response image 4B). In other words, the upregulated genes presumably responsible for the steatosis observed in DKO mice are actually downregulated in Bcl6LKO animals. Yet, genes upregulated in both models are enriched for biological oxidations, which was consistent with the role we describe for BCL6 to repress genes involved in fatty acid oxidation. In a similar manner, we compared differentially expressed genes from liver Bcl6 deletion to those from liver Hdac3 deletion (Hdac3LKO). We found 638 genes differentially expressed (p-value < 0.05) in both Bcl6LKO and Hdac3LKO mutant lines (Author response image 4C). Genes up in both models were enriched for functions in biological oxidations (Author response image 4D), but there was no signature for lipid synthesis or storage. However, among genes differentially expressed in Hdac3LKO but not in Bcl6LKOmice, we detected increased expression of lipid biosynthetic genes (Author response image 4E). 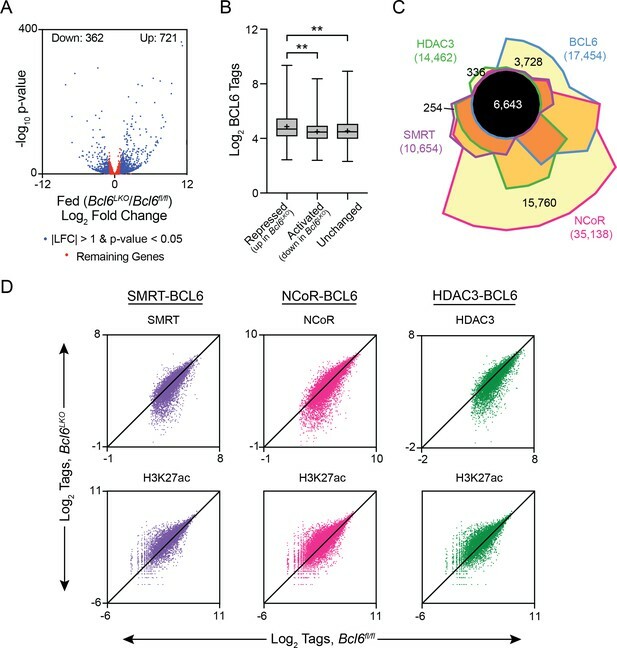 In summary, while some categories of SMRT/NCoR-regulated or HDAC3-regulated genes resemble BCL6-regulated genes, overall expression is not well correlated. This likely underlies the opposing phenotypes of liver SMRT/NCoR or HDAC3 models compared to Bcl6LKOmice. BCL6 suppress fatty acid oxidation genes while SMRT/NCoR and HDAC3 suppress lipogenic genes. (A) Comparison of log fold change (LFC) at significant (p-value <0.05) differentially expressed genes in both Bcl6LKO and Ncor/Smrt double knockout (DKO) livers over control samples. (B) Pathway enrichment analysis for genes differentially expressed in Bcl6LKO and DKO livers based on direction of change. (C) Comparison of log fold change (LFC) at significant (p-value <0.05) differentially expressed genes in both Bcl6LKO and Hdac3 knockout (Hdac3LKO) livers over control samples. (D) Pathway enrichment analysis for genes differentially expressed in Bcl6LKO and Hdac3LKO livers based on direction of change. (E) Pathway enrichment analysis for genes differentially expressed only in Hdac3LKO livers over control (left) and sub-pathway analysis of ‘monocarboxylic acid metabolic process’ (right). We thank Joe Bass, Liming Pei, and Debabrata Chakravarti for helpful advice and discussion. We thank Northwestern University’s Comprehensive Metabolic Core and Mouse Histology and Phenotyping Laboratory (supported by NCI P30-CA060553 awarded to the Robert H Lurie Comprehensive Cancer Center) for services. This work was funded by NIH grants R01DK108987 (GB) and K08HL092298 (GB), American Diabetes Association Award 1–17-IBS-137 (GB), and NIH T32 GM008061 (MS). Animal experimentation: All animal care and use procedures were conducted in accordance with regulations of the Institutional Animal Care and Use Committee at Northwestern University, protocol IS00004929. © 2019, Sommars et al.